Iatrogenic facial nerve palsy in mastoid surgery is considered a crime or a taboo in the present scenario of medical science. But one has to accept the fact that every otologist encounters this entity at some point in his/her career. Hence it is of prime importance to be equipped to detect and to manage these cases. The obvious and disfiguring facial deformity it causes makes this a dreaded complication. Our article here discusses our experience in managing four cases of iatrogenic facial palsy. The etiology in all the cases was mastoidectomy for cholesteatoma. The detection of the site and repair was performed by the same surgeon in all cases. The facial nerve was transected completely in three cases, and in one case there was partial loss (>50%) of fibers. Cable nerve grafting was utilized in three patients. There was grade 4 improvement in three patients who underwent cable nerve grafting, and one patient had grade 2 recovery after end-to-end anastomosis. A good anatomical knowledge and experience with temporal bone dissection is of great importance in preventing facial nerve injury. If facial nerve injury is detected, it should be managed as early as possible. An end-to-end anastomosis provides better results in final recovery as opposed to cable nerve grafting for facial nerve repair. With the advent of high-quality microscopes and facial nerve monitors, the chances of iatrogenic facial nerve palsy have come down dramatically. But there is always a chance that an otologist will encounter this complication at some point in time. The deformity associated makes it a very obvious and disfiguring complication. The medicolegal implications and the delayed and guarded recovery of such patients leave a bad scar, not only on the patient but also on the surgeon. Thus, one should always try to prevent injury and also be aware of the treatment options in case one encounters the same. The patient and the attendants should be informed about this complication preoperatively and also about the possible need for re-exploration, and obtain an informed written consent. 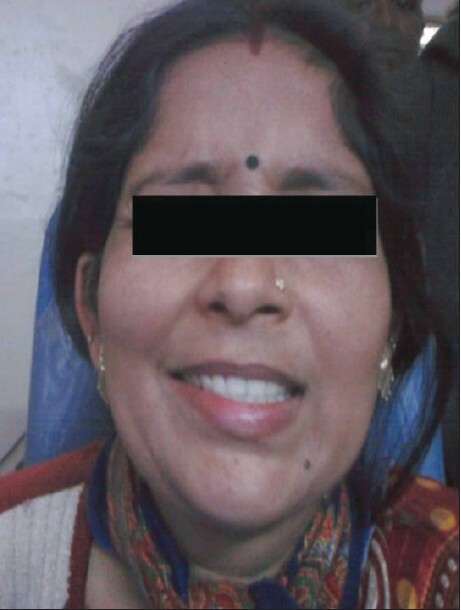 We report four cases of iatrogenic facial nerve paralysis managed at our institute. A 30-year-old male patient was admitted to the ENT ward with diagnosis of postoperative case of mastoidectomy with facial asymmetry. He was diagnosed as a case of attic cholesteatoma with conductive hearing loss. Due to two days' history of giddiness, a labyrinthine fistula was suspected and the patient underwent emergency mastoid exploration under general anesthesia. The operative notes showed attic cholesteatoma with extensive granulation, bleeding, and loss of landmarks. Immediately postoperatively, the patient had facial asymmetry. The patient was evaluated at our institute and posted for mastoid and facial nerve exploration. The sinus and the dural plates were identified and the antrum was found to be lying above the area, which had been drilled previously. There were exuberant granulations causing troublesome bleeding. The mastoid cell system was exenterated with complete disease removal. There was surgical dehiscence of the posterior canal wall. The middle ear was exposed and the facial nerve landmarks were identified. The processus cochleariformis was identified and the facial nerve was traced posteroinferiorly. It was absent in the horizontal part. The vertical portion was skeletonized from the diagastric ridge proximally. The facial nerve was also found to be damaged in the upper half of the vertical part and the adjoining 2 nd genu region. A groove was drilled for the facial nerve. A cable graft was harvested from the greater auricular nerve. The facial nerve edges were freshened with a fresh 15 number knife. The cable graft was sutured with two 10-0 nylon stitches at the two ends. Anastomotic sites were further secured by wrapping around the autologous temporalis fascia. The granulations were evaluated histopathologically and yielded no doubt of any chronic granulomatous disease. At 1 year follow-up, he has grade 4 recovery. A 23-year-old male patient underwent mastoid exploration in a private hospital. He was referred on the 3 rd postoperative day with a history of immediate postoperative facial asymmetry. On evaluation, the patient was found to have grade 6 facial nerve palsy (House-Brackman grading). He underwent an emergency mastoid re-exploration. Intraoperatively, (like in Case 1), without identifying the antrum, the previous surgeon had drilled anteroinferior to the original location of the mastoid antrum. In doing so, he knocked the vertical portion of the facial nerve. The mastoid work was completed along with complete disease removal. The two ends of the facial nerve were exposed for about 1 cm to achieve good decompression. A cable nerve grafting using the great auricular nerve was performed after freshening the edges. The patient had grade 4 recovery at a follow-up of 1 year. A 19-year-old male patient underwent right mastoid exploration for an attic cholesteatoma. He was referred to us with a history of ipsilateral facial asymmetry, developing on the 3 rd postoperative day. The relatives and the patient gave a history that the face was deviated from the 1 st postoperative day itself, and it had gradually progressed to the present status. The patient was found to have grade 5 facial nerve palsy. On re-exploration, the facial nerve in the 2 nd genu region was found to be lacerated, with loss of about 80% of fibers. The facial nerve was decompressed for about 1 cm proximal and distal to the injury site. A single suture was used to approximate the two ends without any intervening graft. The patient had a good improvement of palsy with improvement to grade 2 at 6 months of follow-up. A 45-year-old female patient underwent right mastoid exploration for a posterosuperior pocket cholesteatoma. She was referred to us with a history of facial asymmetry developing on the 3 rd postoperative day. The patient presented to us only after 1 month with a history of immediate postoperative total facial asymmetry. On re-exploration, there was laceration and loss of segment of the nerve detected at the 2 nd genu region. The two ends of facial nerve were identified, and after decompressing the facial nerve on either side of injury, a cable grafting, using the greater auricular nerve, was done. She improved to grade 4 at 8 months of follow-up [Figure 1]. For an inexperienced surgeon, the fear of damaging the facial nerve may lead him to avoid the facial nerve and hence more chances of damaging it. Prior theoretical knowledge of facial nerve anatomy and experience of temporal bone drilling in the temporal bone lab is of extreme importance in preventing facial nerve injury. In the first two cases, the surgery was performed by a surgeon who failed to identify the mastoid antrum and started drilling anteroinferior to the mastoid antrum, thereby injuring the vertical portion of the facial nerve. Thus, we emphasize the importance of identifying a surgical landmark early in the surgery, i.e., the mastoid antrum. So one should drill saucerizing the cavity and stay superior and anterior in the zygomatic root, hugging the tegmen tympani. In case there is a problem identifying the surgical landmarks, one should not shy away from taking help from an experienced otologist. The last two cases were operated by surgeons working in a smaller private nursing home/district-level hospital. In these cases, the site of injury to the facial nerve was the 2 nd genu. In one case (Case 3), there was partial transaction, and in the 4 th case, it was total. In all of the above cases, there was extensive granulation disease involving the mastoid and middle ear. In granulation disease, the identification of the facial nerve and differentiation between the facial nerve and granulation tissue at times becomes difficult. In this situation it is important to work from a normal or known to the diseased area, and instead of using the grasping forceps/sickle knife to use Zollner's elevators, which helps to elevate the granulations or the cholesteatoma gently. One should always work along the course of the facial nerve and never across it, which minimizes the risk drastically. If one has availability of a facial nerve monitor, it should certainly be used in complicated cases, making adequate anesthetic modifications. Once there is iatrogenic facial paralysis, it is recommended to re-explore as early as possible, provided adequate facilities (experienced otologist and well-equipped operation theater) are available. The final results depend on the extent of injury. If there is a total transaction with gap requiring cable nerve grafting, then the results are less than optimum, with significant synkinesis. We utilized the greater auricular nerve for grafting, because of it being in close proximity to our operative site and because of ease of harvesting. If anatomical continuity is maintained, the results are good with minimum synkinesis. This was clearly evident in our cases. 1. Write RJ, Herzon GD. Surgery of Mastoid. In: Write RJ, Causse JB, editors. Complication in Otolaryngology- Head and Neck surgery. vol 1. Philadelphia: BC Deker; 1986. p. 25-31. 2. Sheehy JL. Facial nerve in surgery of chronic otitis media. Otolaryngol Clin North Am 1974;7:493-503. 3. Weber PC. Iatrogenic complications from chronic ear surgery. Otolaryngol Clin North Am 2005;38:711-22. 4. Green JD Jr, Shelton C, Brackmann DE. Iatrogenic facial nerve injury during otologic surgery. Laryngoscope 1994;104:922-6. 5. Nilssen EL, Wormald PJ. Facial nerve palsy in mastoid surgery. J Laryngol Otol 1997;111:113-6. 6. Brach JS, van Swearingen JM, Lenert J, Johnson PC. Facial neuromuscular retraining for oral synkinesis. Plast Reconstr Surg 1997;99:1922-33.